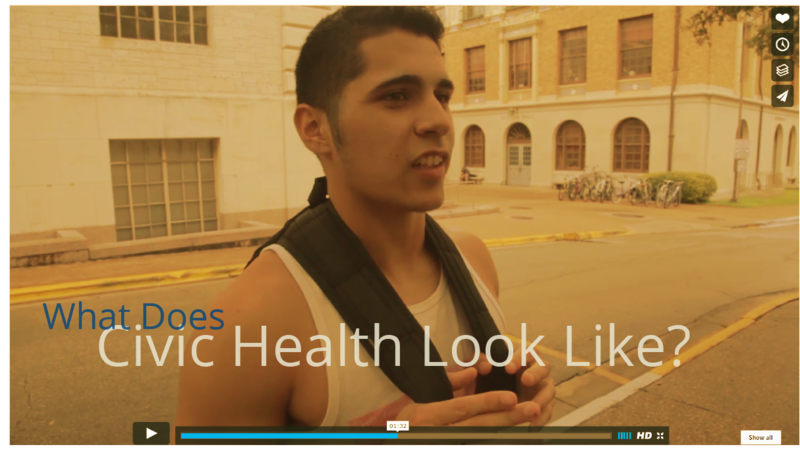 Why is civic health important? The Seattle freeze is thawing! 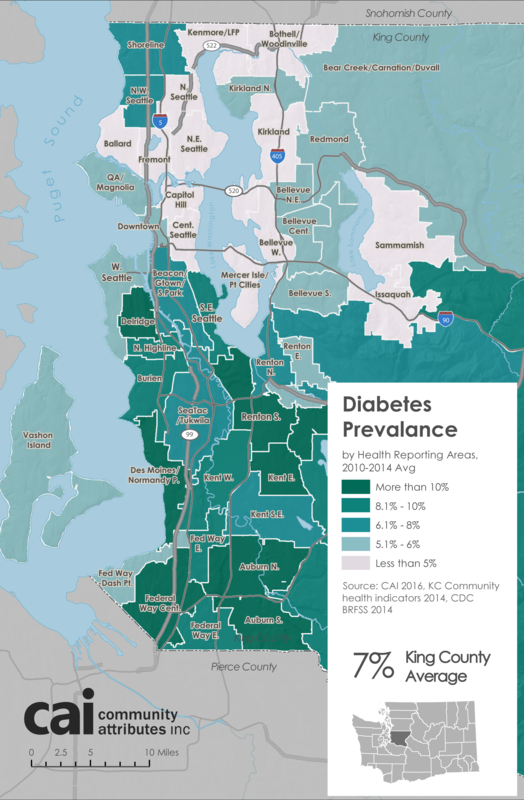 Why invest in greater Seattle’s civic health? Civic health is the strength within a community to work together to tackle collective problems. It’s having places—parks, public squares, museums—and times—holidays, elections, football games—where we connect with one another. It’s having means to express our values and voices and being informed and open to others’ priorities and experiences. It’s partnering with and redressing our government. It’s power and mutual responsibility. Listen to these diverse Americans talk about their views of civic health. Strong civic health positively affects all of us as individuals, and impacts our career prospects, our physical well being, and our relationships with neighbors. It also affects our community’s resilience and prosperity. 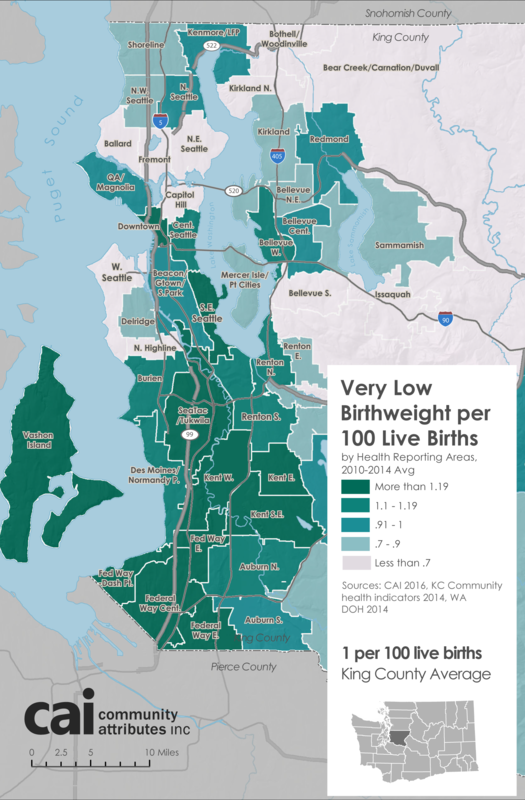 This website reports Greater Seattle’s civic health: its strengths and weaknesses, changes over time, demographic disparities and comparisons to other cities. There’s data, analysis, stories and recommendations for improvement. And because civic health is ever evolving and communal, we warmly invite you to add your ideas, stories and recommendations. Not only will your contribution enhance this report, it will simultaneously build our civic strength! 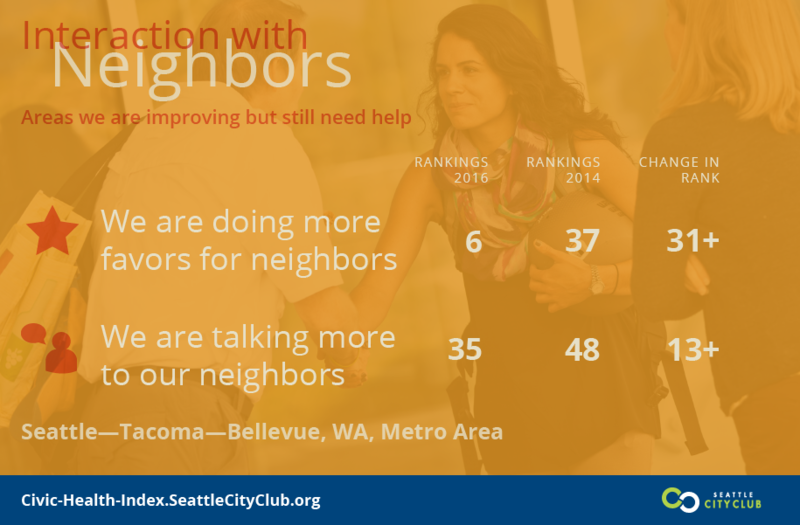 The Greater Seattle Civic Health Index is reported and hosted by Seattle CityClub, a non-partisan organization that informs, connects and inspires citizens to action, in collaboration with the National Conference on Citizenship. It’s assembled with the sponsorship and input of national and regional organizations and advisers. Bill & Melinda Gates Fndn, U.S. Policy, Advocacy, Comm. Anne Martens Bill & Melinda Gates Fndn, U.S. Policy, Advocacy, Comm. Chris Mefford Community Attributes Inc. Thanks to University of Washington interns Sarah Bollard and Kaiyan Zhang for research and collaboration. 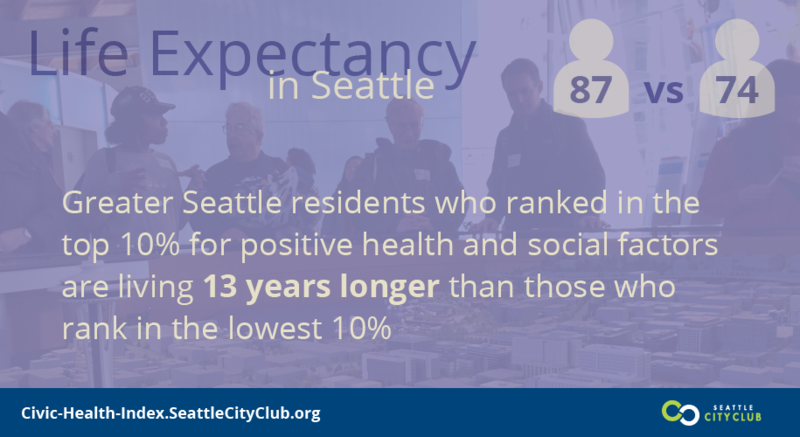 Overall Seattle’s civic health is excellent. 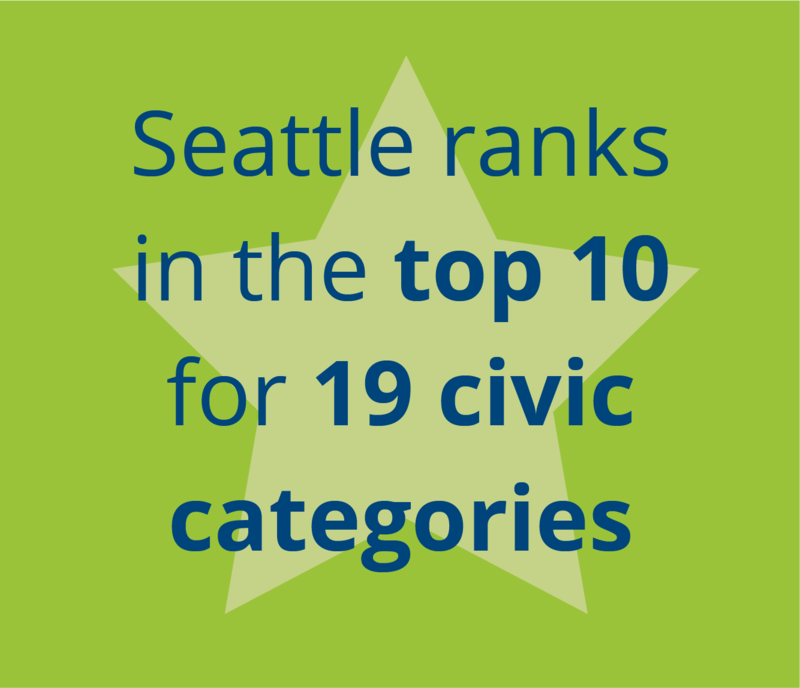 In data tracked by the National Conference on Citizenship, Seattle ranks in the top ten in 19 of 26 civic categories across 51 American cities. We have strong civic institutions and a history of effective citizen activism. We’re especially good at expressing ourselves, mobilizing and organizing to effect change. Since the last Civic Health Index report in 2014, we’ve also improved significant civic weaknesses. There is positive change in our social cohesion — the informal connections that bind communities together and create a sense of welcome and belonging. These civic health measures include engaging newcomers, interacting with neighbors and building public trust. Our data confirm that while the “Seattle Freeze” is real—it is comparatively difficult to make new friends here, especially for transplants from other cities—we have cause for optimism — the freeze is quickly thawing! 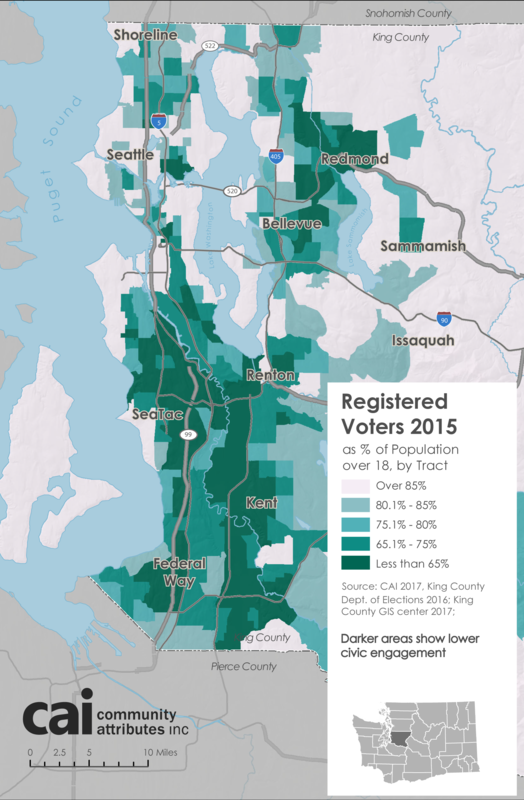 The topline statistics showing Greater Seattle’ civic strength should be celebrated, but they don’t tell the full story. There are significant disparities within citizen engagement, defined by who has access to leaders, who has barriers to staying informed, who is invited to join community networks. 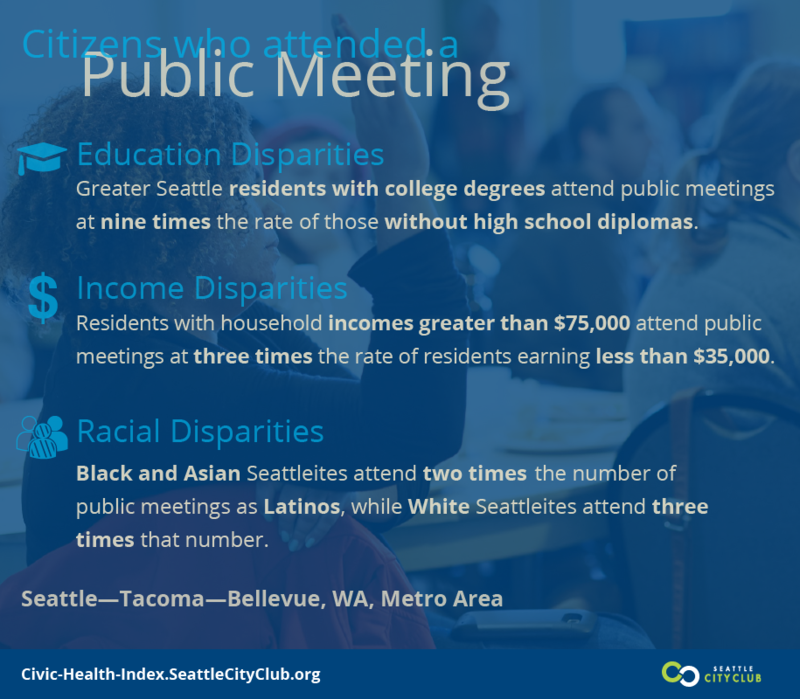 These disparities, caused by institutional racism, language barriers, discrimination, poverty, and unequal access to educational opportunities threaten our civic health and prosperity. Residents who don’t have access to leaders, civic skills or knowledge of democratic power structures to advocate for themselves and their families lack the agency they need to improve their lives. This perpetuates a civic underclass. Residents who don’t have access to leaders, civic skills or knowledge of democratic power structures to advocate for themselves and their families lack the agency they need to improve their lives. This perpetuates a civic underclass. This resource explains the history of racial discrimination in Seattle. A film by Shaun Scott, “The End of Old Days”. 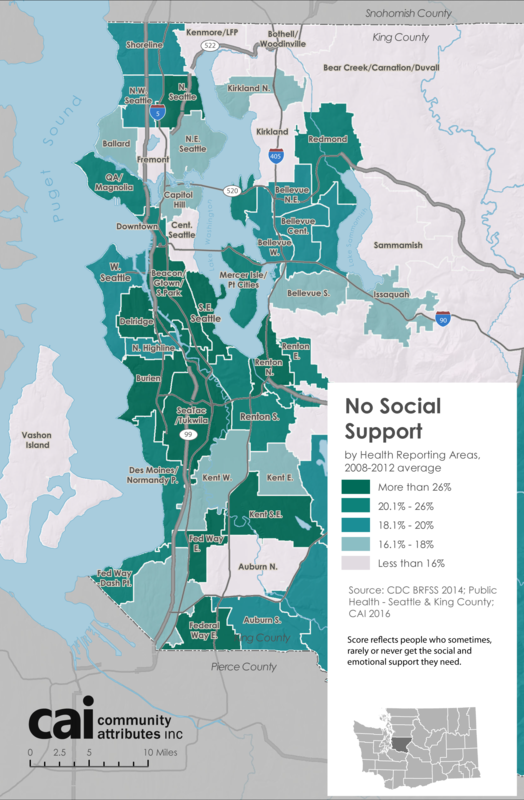 KUOW: Why is Seattle so racially segregated? It takes more than low blood pressure, good nutrition and exercise to make us healthy. In addition to these physical attributes, good health depends on positive personal relationships, economic stability, a sense of safety, secure housing and access to social services. Together these elements make up the social determinants of health, and they affect both individuals and communities. The racial, economic and class disparities found in civic life appear in other social determinants of health, too. 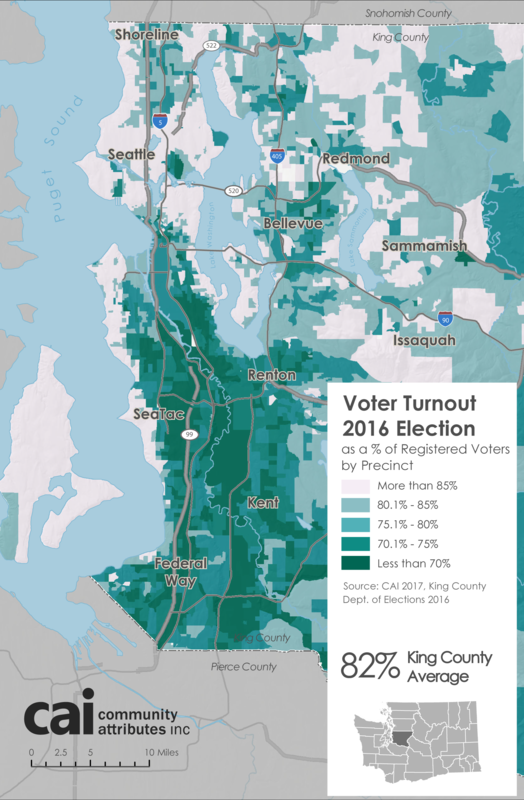 Greater Seattle residents who are less likely to vote and volunteer are also less likely to have access to good healthcare and nutrition options, good schools, parks and social services. This is not a coincidence. Institutionalized racism, segregation, discrimination and poverty impact people’s health and the health of their families and communities through generations. Civic agency—believing you can make a difference in your own and others’ lives and having the know-how and resources to do it—is an essential ingredient of good health. Experts have compared the benefits of being a volunteer with the benefits of joining a gym! Like regular exercise, active civic participation reduces the risk of chronic physical and mental health problems. What’s true for individuals is true for communities, too. Those with a higher percentage of active, engaged residents prosper. They’re more economically resilient. They enjoy higher levels of public safety and trust. They benefit from vibrant nonprofit organizations. Reciprocally, when communities have large numbers of disenfranchised residents, their civic vitality and prosperity suffer. Greater Seattle’s prosperity depends on empowering its citizens, all of its citizens. That means investing in civic education, dialogue, training, pathways, connections, institutions, meeting places. It also means redressing the disparities and inequities that hold us back. - The Committee on National Statistics Panel on Measuring Social and Civic Engagement and Social Cohesion in Surveys. 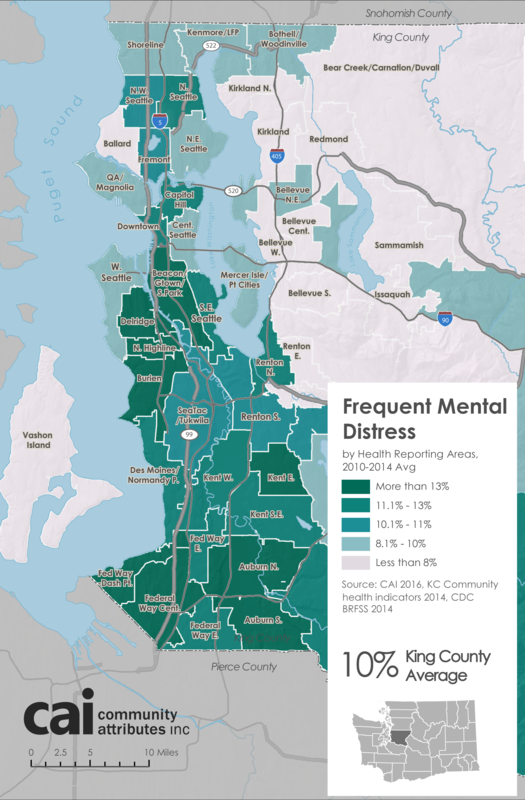 Examine the current state of our civic health and how it affects the lives of individuals and greater Seattle.